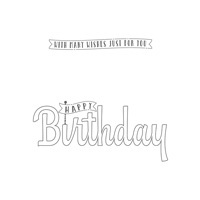 Birthday Wishes for You Clear-Mount Stamp Set by Stampin' Up! Say it, and say it loud–if it’s someone’s birthday they should know about it without any doubt! And add with a swish all the colours that you wish!